Zipped over to the Crescent City Farmers Market for a half hour before heading out to Day 2 of Jazz Fest. 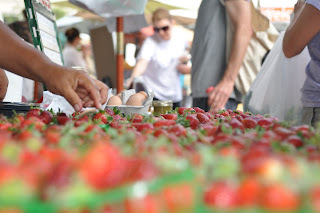 It was so exciting to see, photograph, buy and eat fresh, locally grown strawberries. And, to catch up with Richard McCarthy, co-founder of the market in 1995 and my husband's cousin. Strawberries are in peak season in Louisiana now -- the start of the season is a good two months before ours in New York. 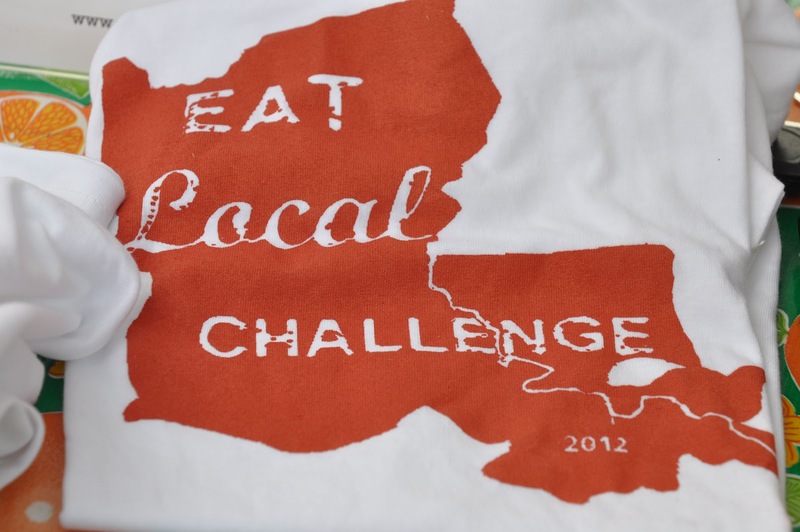 After grabbing a cup of coffee, I bought some berries (which I devoured in the car on the way to Jazz Fest), a pound of Creole Jasmin Rice which I'll pack in my luggage to take home, a watermelon lime juice (so refreshing), and then introduced myself to the folks over at the New Orleans Eat Local 2012 Challenge table. I talked to Gina about the challenge, which helps connect eaters via the resource guide to farmers markets, CSAs, U-Pick and restaurants, to local Louisiana foods during its 30-day challenge that runs from June 1 to June 30th this year. There's also recipes, cookbooks and a guide to the Lousiana Harvest calendar on the website. (Lighthearted Locavore is a partner blog for Northeast Organic Farmers Association of New York's Locavore Challenge which is headed into its third year this fall). The highlight of my visit was finding Richard McCarthy on my way out of the market for a quick hello. It was great to hear about his daughter, wife and parents, and all the good work going on at Market Umbrella, his non-profit which is dedicated to the local food movement. 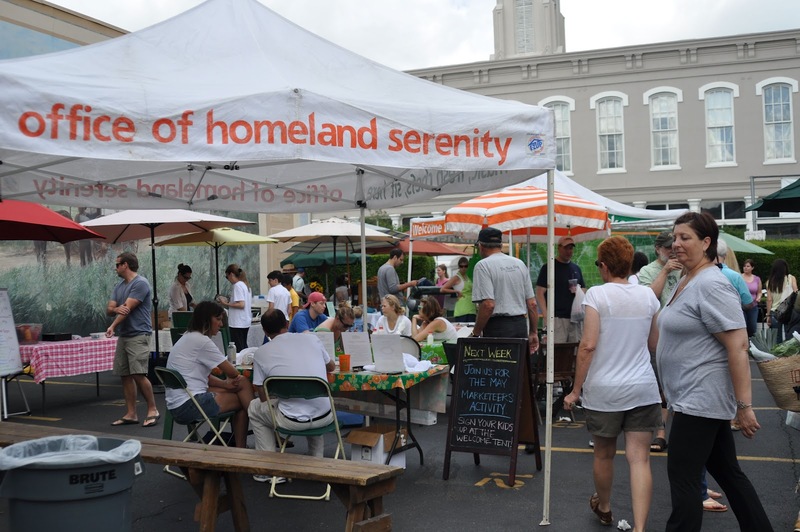 Besides running the farmers market, Market Umbrella has helped New Orleans get back on its feet post-Katrina and post-BP oil disaster and is dedicated to connecting farmers, fishermen and eaters throughout the region and food justice and food access issues (got to love their program to double the value of food stamps at their markets). McCarthy is also a great resource for understanding food politics and policy issues locally, nationally and internationally. In fact, he's named one of the market tents the "office of homeland serenity". LOVE THAT!!! 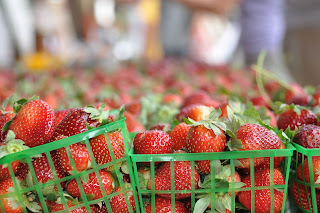 I love to make strawberry rhubarb compote, strawberry sorbet, strawberry ice cream, strawberry jam, strawberry yogurt pops, strawberry jelly omelets, and strawberry breakfast smoothies (check out Lighthearted Locavore for 10 great recipes).